Originally from Cornwall, Cornish miners like Matthew Penhallow and James Reskelly’s father played a critical role in opening the American West by providing the knowledge and experience necessary to extract the rich veins of gold, copper, and silver that lay hidden deep within the earth. When these men and their families came to America, they brought with them strong religious convictions, a great love for music, and a vivid imagination. 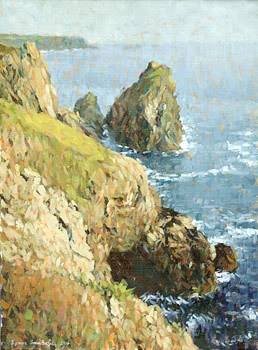 Kynance, Cornwall. Art, Courtesy of Simon Birtall. Cornwall is located on the southwestern tip of England on a large peninsula that divides the English Channel on the south from the Celtic Sea on the north. With contributions from the Celts, Romans, Angles, and Saxons, the land and its people have a rich and colorful heritage. The coastline is filled with tales of pirates, smugglers, and mermaids that dwell and hide among its coves and rocky cliffs, while the land itself is home to the legend of King Arthur. And deep beneath the earth, in mines that snake through the ground, one can sometimes see and hear the tommyknockers. 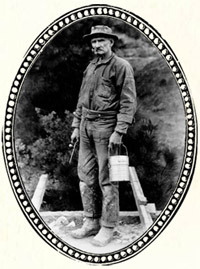 Cornish Miner at the Empire Mine, Grass Valley, California. Image, Courtesy of California Geological Survey. When the tin and copper mines failed in Cornwall during the mid-1800s, many Cornish men and women immigrated to the mining frontiers of North America. They settled in Pennsylvania, Michigan, Wisconsin, Illinois, Montana, South Dakota, Arizona, Utah, Nevada, California, and Colorado. Called “Cousin Jacks” and “Cousin Jennies” in the new territories, these men and women brought with them words that became the standard language of mining: mine pits were shafts; horizontal tunnels were levels; tunnels connecting two levels were winzes and raises, depending on the direction they were cut; and drainage tunnels were adits. The miner’s candlestick and lunch bucket came from Cornwall, along with the Cornish pump that dewatered the mine and the miner's Code of Signals that enabled the hoister to communicate with miners below. More importantly, the Cornish miner brought expertise and an eye for new innovations. Many subsequent inventions made in the American mining industry were achieved by men of Cornish descent.